Your help is appreciated, and as always, please keep me and my family in your thoughts and prayers as we're going through a very difficult time now. Let me mention some facts. Now please bear with me as what you are about to read is not going to sound logical at all, except to CBS's lawyers Wook Hwang and Jonathan Zavin. Then they partially admitted access and copying but that they copied the "de minimis" (the allowable amount) and "Scènes à faire" (common scenes in a specific genre or theme). Then they argued (and I can't believe I'm saying this...) that what they copied has no similarities. And finally, they are now saying that they did not copy because we came with our ideas independently. Now I'm not a law expert or anything but I think even a 5 years old can come up with a better and more logical argument than Wook's. I had to make sure with both my lawyers Allan Chan and John Johnson that I do understand these arguments clearly as they make no sense to me. These arguments are from their actual filed dismissal letters to the court. All they did so far are desperate trials to mislead the court with irrelevant cases while contradicting themselves to a pathetic point. Why would they need to use all these varied and different arguments if they were innocent? Based on Wook's arguments, my elements are not protectable, so the same goes with theirs. None of their material is protectable (Scènes à faire). None of their Star Trek material is protectable. This means (from their arguments) that anyone can create a work with the same bridge crew and the spore-drive and the giant tardigrade navigator. Does that mean The Orville had protection from the beginning and is not treated as a parody? Because honestly, The Orville did not even get close to any of those specific elements from Star Trek as Star Trek Discovery did to my Tardigrades game. Sometimes I feel puzzled how Wook's arguments go past CBS' law department, unless their intention is to damage the IP of the Star Trek franchise to win their battle with me. So far, this is what seems to be going on. Yesterday -March 5th 2019- I filed the Opposition to the Defendants' Motion to Dismiss. Simply, I'm arguing why their "motion to dismiss the case" is not valid. Note that when the judge gave us the "discovery" right to get information from CBS about their Steam accounts, they haven't met their deadline and we still did not get anything from them. On their motion to dismiss, they keep on misguiding the court by stating half-truths, misquoting older cases, and even using poor examples of other tardigrades appearances in media. In fact, the more they try to defend themselves, the clearer the entire picture gets. They have no good arguments. meaning that any space-themed production may use them due to their ability to survive in space. My legal complaint was/is never about tardigrades’ ability to surviving in space as they are trying to say. 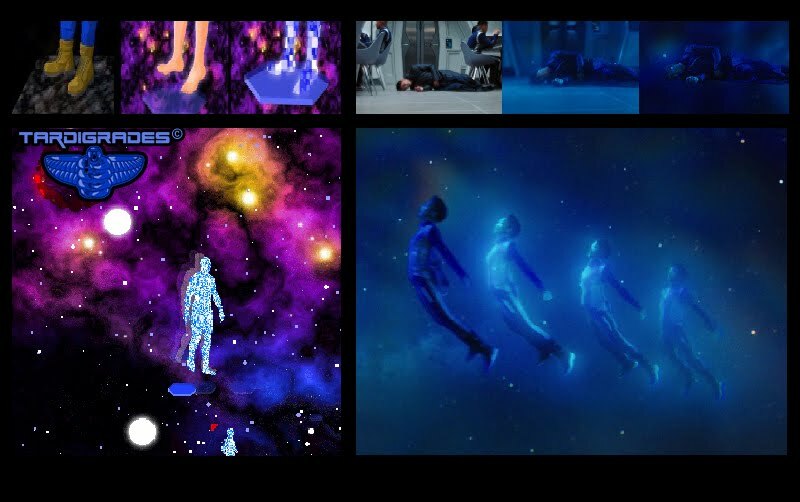 My complaint is simply about the fictional giant blue tardigrades that are used in instantaneous space travel with a blonde male botanist [Carter] whom had encountered interracial homosexual acts with a dark bearded male[Aziz]. They claim that I am enforcing my rights on a Caucasian woman with red hair or a blonde white male. This is patently false, I am asserting rights to my expression of characters created by me. They are breaking down character elements to fundamental elements. I am surprised they did not accuse me of owning rights to a person with 10 fingers or a woman with two eyes and a nose. The characters appearances and sexual orientations are used for the whole picture comparison along with the other elements. This is the heart of the work being compromised. Any person watching the two works will instantly see the similarities and even think they are the same production. In a desperate move, they used poor examples from the internet and other media to show that tardigrades are used commonly in literature. None of their examples is even close to what we have in the complaint. For instance, Captain Tardigrade is a tardigrade's head on a human body with two human arms and two legs. [He] speaks English and doesn't travel without a spaceship. Captain Tardigrade is a unique and a copyrightable expression. Actually, when they put my tardigrade, theirs Ripper, and the real life microscopic creature side by side in comparison, they made it even clearer that they copied mine not the real life creature. So what they're doing is deliberately dissecting the elements of my project to use the basic components for their dismissal request. For instance let's use Darth Vader. They would say you have no rights to that because it's just a white male, with a helmet and robe. They are admitting access and copying,for this one motion, but they say they're copying the "allowable amount" because their tardigrade is shown in a few scenes while the entire show is about 11 hours long. They are saying that their tardigrade doesn't have a major role on the show and the story. I would like to ask these questions to everyone who watched the show: What would season 1 of Star Trek Discovery look like without the tardigrade and its DNA's help to jump instantly from one place to another? How would they jump to another dimension? How did they win the war against the Klingons? And while they were away from our dimension, didn't the Klingons take over big portions of the galaxy because the tardigrade technology wasn't available? Finally, in another desperate move, they are claiming that I'm collecting bits from here and there to match my game to their show with similarities. It seems like it hit them hard that Carter the blonde botanist who is researching the tardigrade space travel has encountered an interracial homosexual act with black bearded Aziz in the glory hole scene that was posted on my blog [link], twitter[link] and AGS forums[link] before their show aired. Even though I didn't show explicit images, the post is clear: "A newly drilled hole on one of the toilet dividers by Aziz" and you can see Carter's foot tapping as an invitation to the sexual act. Anyone with basic knowledge of the LGBTQ community knows what glory holes are, and at least has basic knowledge of the gestures. How could such a large television network be so out of touch and not inclusive of a community of people that is so underrepresented in television? If one would believe their legal argument, Star Trek would also have no copyrightable elements. Today is Maarten's first birthday after his passing on June 11, 2018. I will not speak of him in the past tense because he's still present with us. Maarten Amkreutz goes by the online name Amayirot-Akago, the most fun and lovely human being one can imagine. I have put a video showing some of his photos and screenshots from his game Postman's Quest. Maarten likes Sierra games and they were his first games to play. There's a comment on a YouTube video where he mentions how much he likes St George's Book Store music from Gabriel Knight, so I learned it for him and played it in the background of this video. I hope you like it Maarten, I love you man. Star Trek Discovery claims for a frivolous lawsuit has no steam. Yesterday, January 2nd 2019, a joint letter was sent to the judge. The defendants are trying to dismiss the case. First they were defending themselves by saying that I'm trying to own copyrights to the real life microscopic tardigrade. I have never claimed by any mean that I owned the rights to the real life microscopic tardigrade. Now they are saying I cannot copyright "enlarged Tardigrades in space". The creatures in the game are huge Tardigrades, blue lit and being the research subject by a blonde botanist of which later will be used to facilitate instantaneous space travel. 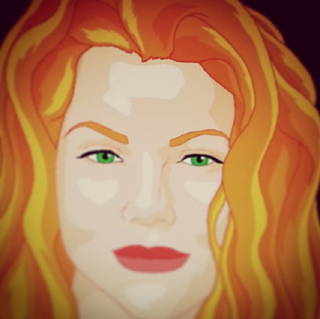 I've been posting development updates on my blog, Steam, AGS forums, Twitter, Reddit, YouTube... since May 2014 and I have always engaged with comments and discussions with fans and friends. The defendants are trying to emphasize on the few elements from their show that were not taken from my work. We dug up an old case which has an interesting line: "No plagiarist can excuse his wrong by showing how much work he did not pirate." Sheldon v. Metro-Goldwyn Pictures Corp., 81 F.2d 49, 56. The defendants are also trying to say that my original ideas would qualify as Scènes à faire, like when a sci fi story includes a starship, a space captain, an engineer, a science officer and an alien. However, the expression of these characters as in facial features like pointy ears or ridged forehead are protected, Mattel, Inc. v. Goldberger Doll Mfg. Co., 365 F.3d 133 (2d Cir. 2004). So according to the defendants, a blonde botanist doing a research on giant blue tardigrades to be used in space travel should be a common trait in science fiction movies just like "fast draw" scenes and bar fights in western movies. The distribution of my project before September 2017 is quite excellent too. 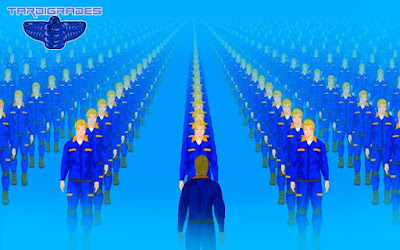 Before September 2017, my YouTube channel had a total of 3.2M views, the Tardigrades game-in-production thread on the AGS forums had 200K views and 500 comments replies making it the top adventure game-in-production of all time. My blog here had 100K views. Tardigrades was also Greenlit on Steam. For those of you who don't know what Steam is, Steam is the biggest gaming platform on the net. Game developers post demos, alphas, even concepts to the Steam Greenlight website, people start voting by answering this question: "Would you buy this game from Steam?" After getting enough votes, the game gets Greenlit, which means when its development is complete, Steam does some arrangements to host and sell the game on their massive platform. Note that there are several old Star Trek games on Steam even prior to 2014. Funny thing is, they might have even voted for Tardigrades. 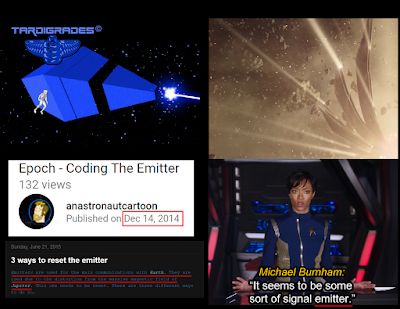 Back in 2014, I posted an update about The Emitter Spaceship. I was mainly focusing on demonstrating the non-linearity aspect of the game by showing the different ways the player can solve the puzzle associated with The Emitter Spaceship. Here's a link to the post from 2014. You can find more information on this post from 2015. I wanted to keep you updated regarding the Tardigrades and Star Trek Discovery post from October 18th 2017. First of all, I want to thank everyone who posted videos, articles and even talked about the issue in their social media. The last 10 months were so hard on me and the development of the project. I tried every possible way to have a respectful and reasonable discussion with CBS but they treated me in disrespect and just dangled me around with postponing meetings due to their vacations and being busy. The first conversation turned into the last one. I gave them a lot of time to make things right. Unfortunately, I found myself at a dead end with them, and so I had to enforce my rights by filing a lawsuit to treat me seriously. 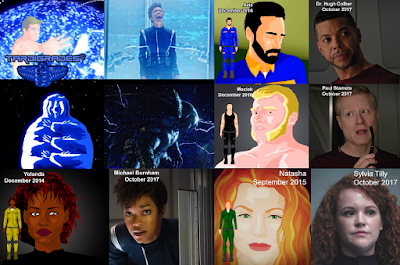 I've been approached lately by some of my fans via twitter, facebook, youtube and the AGS forums about several similarities between the new series Star Trek Discovery and my point and click adventure game Tardigrades. I honestly don't know how to begin this article, so I prepared a few screenshots from both the TV show and my game for comparison. I am doing this to clarify that I haven't stolen ideas from the show at all since all of my posts from the devlog are dated years before the show. Tardigrades production announcement was on May 8th 2014. The devlog can be found here. The game is about a civilization that lived on Earth 20,000 years ago. They are on the verge of intergalactic travel using giant Tardigrades to travel anywhere in the universe. The main character, Carter, is a botanist whom will discover later in the game the connection between the super tough creature and instantaneous space travel. I've made several promo videos that can be found on my YouTube channel that show my ideas of space travel using giant Tardigrades. I also have a homosexual couple with each of the men is assigned in different parts of the solar system. They are: bearded "middle eastern" Aziz and his boyfriend Ty who is in some danger situation. Later on the game another character is imprisoned with Aziz, his name is Maciek, a very white blonde dude. To their defense, I think having a diverse crew is very relevant. It's just the too much coincidental appearances of the characters that may put my project into a weird situation. Not to forget that Paul has a "friend" in another federation ship that gave a hint of a long distant relation just as Aziz (Jupiter orbit) and Ty (Titan base) from Tardigrades.